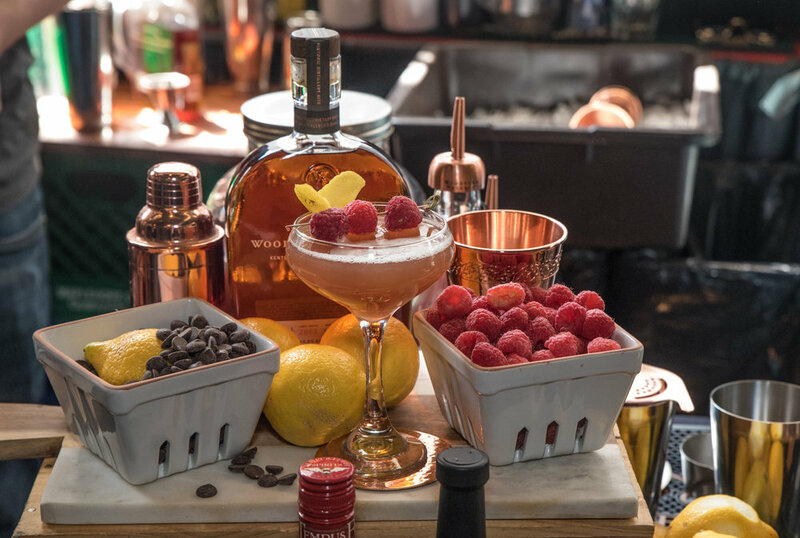 In this epic edition of Food Fight, it’s a battle of the booze, wherein our contenders serve up a one-two punch of food and drink using a five-category flavor wheel for a proper tasting of the secret ingredient. Each pairing incorporates palate-pleasing notes of grain, wood, sweet aromatics, spice, and fruit/florals that make our taste buds want to sing karaoke and make inappropriate phone calls. Without further ado, the secret ingredient for FLL issue 46 is Woodford Reserve bourbon. 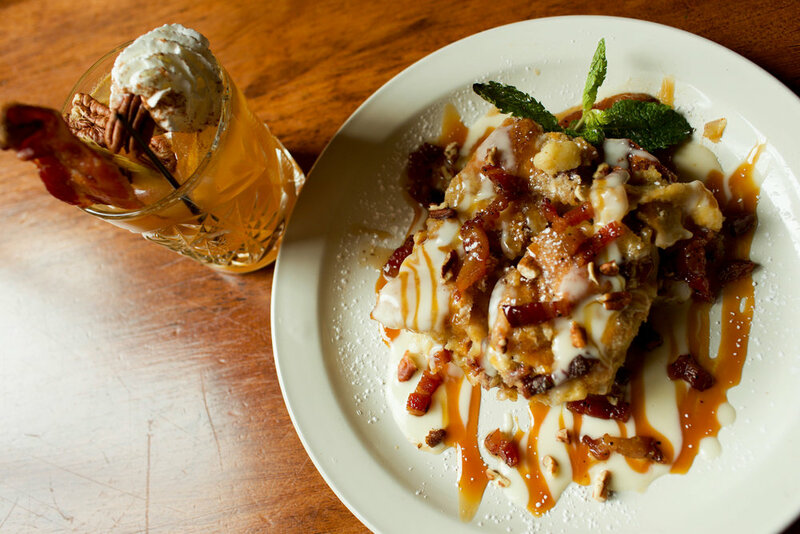 Woodford infused bread pudding. Bacon infused Woodford Reserve, with a house-made pecan liquor and house cinnamon-sugar syrup and local Kauffman’s apple cider. Woodford Reserve, abrosio rice, roasted walnuts, dried cranberries, gorgonzola cheese, vegetable stock, fresh parsley. Woodford Reserve, Disaronno Amaretto, cranberry shrub, black walnut bitters, and club soda. 116 hour smoked and sous vide brisket served with roasted and bruised sweet potatoes and smoked walnuts with stilton cheese and smoked turkey collard greens. Smoked cherries and honey Woodford Smash. Lambchetta - lamb belly, stuffed with lamb sausage. Garlic mashed potatoes, vegetable medley. Woodford Reserve and apple cider reduction demi-glace. Smoked Old Fashioned - house-made pear bitters, ginger simple syrup and Woodford Reserve. Garnished with orange and smoked black cherry. Cacao Mole Commodore, Woodford Reserve Bourbon, repurposed Pod Cacao Juice, Creme de Cacao, lemon, raspberry mole shrub, Angostura & Corazon Bitters. Woodford caramel & cacao fruit sherbet sandwich. Bourbon Smoked Lamb Rack on a mint, kale & radish pesto, Woodford basil sauce. Citra Reserve, Woodford Reserve, Cointreau, Amaro, orange bitters, strawberry rhubarb shrub by The Hudson Standard, and orange peel garnish. Woodford Reserve, jalapeno and hibiscus infused agave nectar, lemon juice, fresh watermelon juice, mint. Spicy pork tacos, red cabbage, guacamole, pico de gallo, and a Woodford Reserve watermelon glaze. Blackened salmon, cooked orzo, baby arugula, basil, mint, grapefruit Supreves, flat leaf parsley, pomegranate balsamic reduction. House made blackberry pomegranate simple syrup, Woodford Reserve bourbon, barrel aged bitters, topped with housemade mint sparkling soda over crushed ice. Check out the print copy of FLL 46 to see the winners!